Rondo style paper napkins with tea themes are available in light, embossed paper and as rice paper napkins. Rondo Napkins are folded in quarters and open to a full round napkin. Soft and elegant napkins. Fan shaped with scalloped edges, about 6 inches. White background with teapot design. Soft and elegant napkins. Fan shaped with scalloped edges, about 6 inches. Sheer, delicate, yet durable silken rice paper napkins. The rhondo luncheon napkin is fan shaped with scalloped edges, about 9 inches. 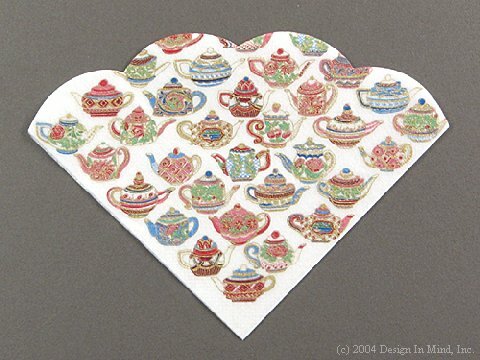 The matching square tea napkin is 4 1/2" folded. Made in Japan.